In a large skillet, heat oil over medium heat. Add onion and cook until translucent. Add zucchini and stir in corn. Reduce heat to medium-low and cook for 12 minutes, stirring frequently. Turn off heat, add Cotija cheese, lime juice, toss and season with salt. Serve and enjoy. Add 1 chopped Serrano chile for a spicy version. Serve as a side dish to any protein dish. 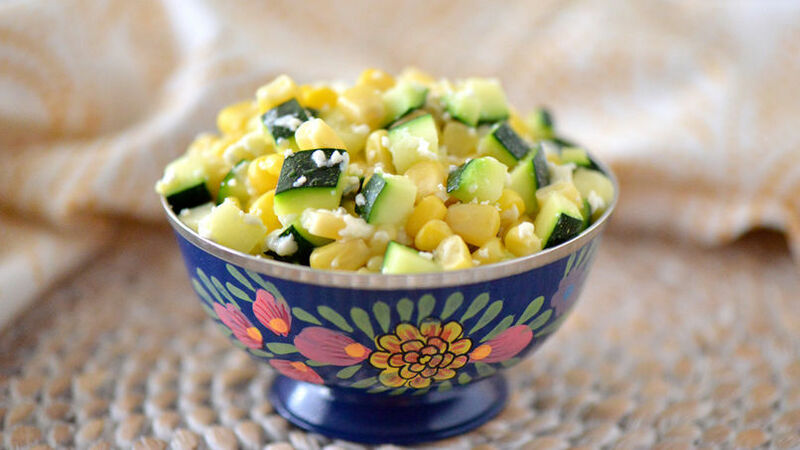 Corn and zucchini is a flavor combination that takes me back to my childhood. Served as a side dish or a compliment to Spanish rice, this recipe makes a great Thanksgiving side everyone around the table will welcome with open arms. Make it extra cheesy for the kids with the addition of shredded melting cheese and crema.